The other day after class, my friends and I hung out at my boyfriend's house. While we were hanging out, my girlfriend decided to bust out her manicure sets and started painting her nails. I left two of my nail polish at my boyfriend's house, so I decided to join in. The colors I got were from sinful colors. It's from Walgreens and I think they're about $1.99 each. They're really cheap, but since they were cheap, the quality isn't that great. The color wasn't as opaque as I thought it would be. It also took me a lot of layers to fully cover my nail. I like the color combination of the two nail polishes. It reminded me of watermelons, but I remembered that I had the white nail art pen that I bought before. I really don't like that pen because there wasn't much color coming out from it. Also, after it dried up on my finger, it came of so easily. I didn't even need acetone, I just rub my finger on it. 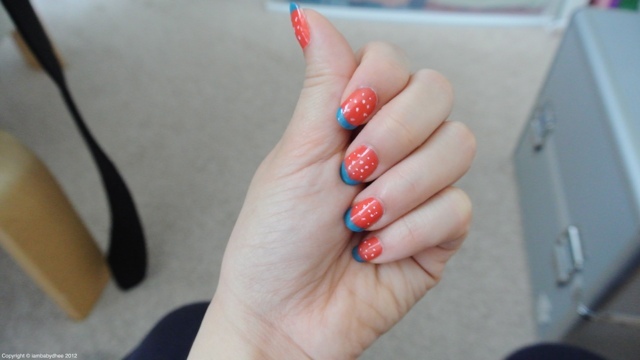 Since the dots on my fingers were white, it looked more of a strawberry than a watermelon, so I just went with it. There is no such thing as an impossible dream. Some dreams just require more effort.